We thought it was high time we did a list of the blue plaques of one of South London's most well-known areas - Peckham. There is no doubt that Peckham is up there with Wimbledon and Greenwich as one of the place names most synonymous with South London, and this maybe down somewhat to the success of the sitcom Only Fools and Horses, which, as most of you probably know, was set in Peckham. A lot like much of South London, Peckham has a relatively low number of blue plaques, and there are actually only 3 'official' blue plaques in the whole area. Alongside these 'official' plaques, which are part of the scheme run by English Heritage and the London County Council before them, there are also plaques voted for by the people of Southwark. Though these are also blue, they don't have quite the same status as the others, but we thought we'd include them anyway because the people and things they commemorate are still significant. We have made it clear, however, which plaques are Southwark plaques. So, without much further ado, here is our list of the blue plaques of Peckham. Born in Kingston, Jamaica in 1882, Moody arrived in the UK in 1904 to study medicine at King's College, London. After qualifying as a doctor in 1910, he was denied appointment after appointment because of the colour of his skin, and was forced to start his own practice at 164 Queen's Road in 1913. While his practice became very successful, Moody took it upon himself to help black people who came to him in need of assistance, having suffered degradation and humiliation because of their skin colour. 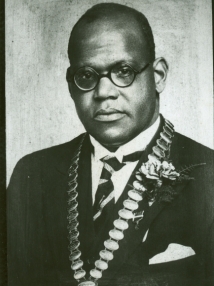 His forthright attitude in representing these individuals galvanized other middle-class black people into joining him, and together they founded the League of Coloured Peoples in 1931. The League sought to protect the interests of its members, unite members behind the common goal of improving the welfare of black people across the world, and to improve relations between races. Moody died in 1947, and though the League was primarily concerned with black rights in the UK, it was also heavily-involved in other civil-rights issues, such as the persecution of Jewish communities in Germany. Oliver Goldsmith was an Irish novelist, playwright and poet best known for his 1766 novel The Vicar of Wakefield and his 1771 play She Stoops to Conquer. He is commemorated in Peckham by a park, a school, and a housing estate - the key question is, why? Having graduated from Trinity College Dublin in 1750, Goldsmith had looked to continue his education while indulging in the eighteenth-century obsession with touring Europe. After the death in 1756 of the uncle who had supported his studies, Goldsmith settled in London as an usher (basically a teaching assistant) at a Presbyterian boy's school in Peckham. Though apparently not the happiest of times for Goldsmith, it was while in Peckham that he would become a creative contributor to the 'Monthly Review' and from there his literary career took flight. The school he worked at was actually named after him during his lifetime, but was demolished in 1876. The current school named after him was built in 1900. Born at this house in 1894, Sir Alan Cobham, though he was just 'The Cob' back then, was a member of the Royal Flying Corps during the First World War, having been educated at Wilson's School (then in Camberwell). It was when he became a test pilot for the de Havilland aircraft company after the war that he would become famous. During the 1920s he made several long-distance flights across the world, including a 5,000 mile air tour of Europe, which saw him visit 17 cities in 3 weeks. He was knighted in 1926 at the relatively young age of 32, and would go on to tour the country with 'Cobham's Flying Circus' during the 30s. Born in Islington in 1834, Sir George Livesey was a British engineer, industrialist and philanthropist. He was a very influential figure in Victorian Southwark industry, and was chairman of the South Metropolitan Gas Company, having inherited the business from his father Thomas. He founded the Camberwell Public library in 1890, the building at which he is commemorated, which would then become the Livesey Museum for Children in 1974, but was shut in 2008. Forever tied with Peckham as an area, he was married in 1859 at St Mary Magdalen in Peckham, and is buried at Nunhead Cemetery, having died in 1908. Carrying on from the previous entry, the Pioneer Health Centre was opened by Dr Innes Pearse and Dr George Scott Williamson in 1935 to continue "The Peckham Experiment." The aim of the experiment was to study health as a medical condition in a manner comparable to studies of the natural history of disease, and they chose Peckham because its "populace roughly represents a cross-section of the total populace of the nation with as widely differing a cultural admixture as it is possible to find in any circumscribed metropolitan area". The initial phase, which began in 1926 and ended in 1929, was conducted in the house at which they are personally commemorated. They moved their experiment to the Pioneer Health Centre (designed by Sir Owen Williams) in 1935. For this phase they recruited 950 local families, who for 1 shilling a week were given access to a range of leisure activities, all housed within the centre. The experiment finished in 1950, and the building carried on as a leisure centre, but was sold off in 1990 and converted into housing. Easily one of the most famous and gifted footballers to come out of South London, Rio Ferdinand grew up on the Friary Estate, where he is commemorated. Born at King's College Hospital in Denmark Hill, he was educated at Blackheath Bluecoat School. Though from South London, he never actually played for a South London team, and spent his career at West Ham United, Leeds United, Manchester United and QPR, while earning 81 England caps. An unusual selection for a plaque due to the fact that he is still alive - most plaques commemorate those who have passed away. where in peckham can you use your card?